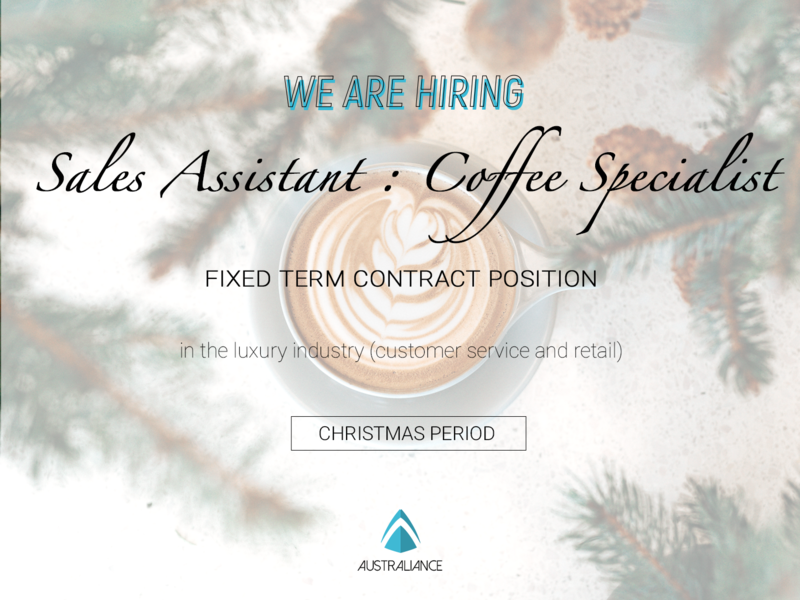 Australiance is looking for coffee specialists for a renowned company in the coffee industry. Do not hesitate to apply if you are interested in this opportunity! As a leader in the coffee industry, our client has the most sophisticated boutiques designed to deliver an unforgettable and exclusive luxury retail experience. Our client strongly believes that people are the key of his success. Borne out of a passion for great coffee, innovative thinking and the belief that consumer pleasure should be at the core of everything, the brand continues to thrive thanks to a strong culture that still holds these principles central to everything that our client does. If you feel that you fit with this spirit, do not hesitate to apply. In addition to working for a brand that will motivate and inspire you, you will also be well rewarded working with a friendly team in a professional, flexible and high performing environment. You will receive ongoing training to help you develop your skills and give you the potential to build your career with the group. Exposure to a fast paced environment within a customer facing role. A professional attitude, excellent personal presentation and the ability to embody our sophisticated approach. From mid November 2018 until mid January 2019. We will get back to you within 24 hours (weekends excluded) and if short-listed you will have a first phone interview with our client and be invited to an in person interview.